Jason has a very pleasant personality and was very thorough. Excellent service. Answered all of our questions and gave us time to discuss and make a decision. The technician was knowledgeable and provided us with excellent service. Very friendly and advised us of additional service Axberg provides. Technician failed to reconnect blower motor wires. Furnace safety shut down furnace. Temp dropped to 65. Had to main office for on call technician to come out at 1:00 AM to fix. Tech worked no more than 15 minutes. All past service calls at least 30 minutes. Didn't vacuum HRV either like all other techs. Hard to believe work was thorough. We had a leak and they were supposed to come last night, but postponed until today. That was a small inconvenience, but the plumber showed up 5 minutes early this morning ready to work. He completed the repairs and kept me informed along the way. Very satisfied. fixed my leaking cobled up mess with professional plumbing. Absolute proffesional outfit. A relief to work with someone of this high caliber. Prompt, did a great job. Nice guy. Called him back inside to answer a question I had. David was very helpful with that. However not certain the estimate fee was removed. Wish I could get seamless gutters as easily as I got this job taken care of. I'm going to have your company look at my electrical issue. Pretty certain you folks will be my go to company. Service was explained well. area was left clean. 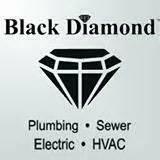 Black Diamond schedules a window of time and their people always arrive within it. The service is excellent. The personnel are friendly and very efficient. And this time Ryan Hicks arrived for the furnace checkup. He was great. Enjoyable to talk to. Totally knowledgeable, answering all my questions. Jason was personable and very knowledgable. I would recommend him to friends and family. The company has great communication between staff and clients. They were flexible with scheduling and arrived when they said they would. Friendly, at a good price! Greg was very nice and informative and I didn't feel like the price was too much for the work that was done. Very friendly courteous service. Fixed the problem right away. I will recommend them.